Bland pasta is a sad, sad thing. 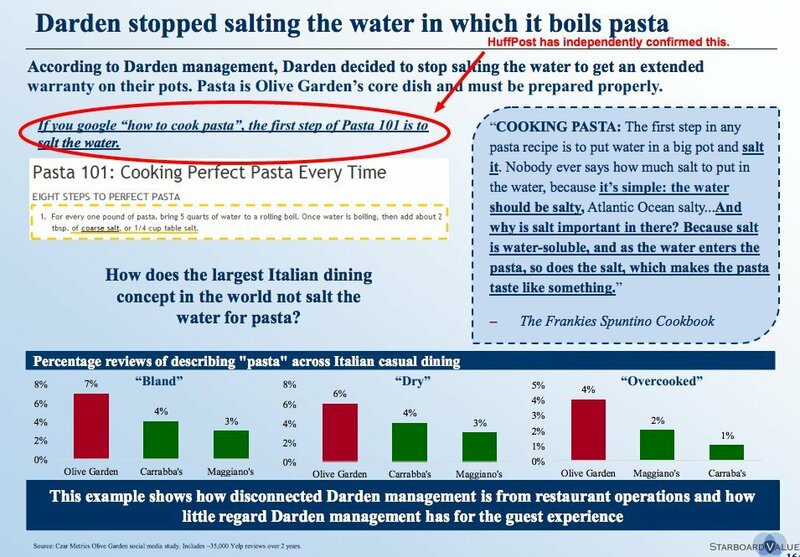 Though it may not be surprising that Olive Garden has no freaking idea how to cook pasta, we ARE pleasantly surprised at how outraged the general public is at this failure to execute the most basic of cooking techniques. Thank heavens, America knows it's supposed to salt its pasta water. Olive Garden claims it skips this vital step because the salt wears down the pasta-cooking pots, meaning O.G. has to replace them more frequently. So that got us wondering: Is that even true? We got to the bottom of it, and below, we've answered your most burning questions about Olive Garden's Great Salted Pasta Water Scandal. So, does salt REALLY ruin pots? HECK YES. Here's the simple solution: Rather than salting your water when it's cold, which gives the elements way too much time to interact, throw your salt in the pot after the water has come to a boil. At that high temperature, there isn't enough oxygen in the water for the reaction to take place. Olive Garden, are you listening? Salt your water AFTER it has come to a boil. Easy. Is there a scientific reason we should be salting our water? No. There's an old wives' tale that says salted water will make the pasta cook faster, and while it's not entirely untrue, it doesn't make enough of a difference to matter. An ounce of salt only raises the boiling point of water by 1 degree Fahrenheit, so you'd need a whole lot of salt to make a significant difference in the cooking time -- a whole disgusting lot. So the only reason to salt pasta water is to make the pasta taste better? Bonus: If your pasta has been properly salted, it often means you don't need as much salt in the accompanying sauces. And also, don't worry about all the salt you're throwing in the pot. Most of it will go down the drain when the pasta water is dumped out. So how much salt should I be putting in my pasta water? People often suggest that your pasta water should taste like the sea, but have you ever tasted the actual sea? I have, and I would never purposely put it in my mouth again. There is no hard-and-fast rule about how much salt to put in your water, but if you absolutely need a guideline, listen to Marcella Hazan. She suggests that for every pound of pasta, add no less than 1 1/2 Tb of salt. (And of course, she also smartly suggests adding the salt AFTER the water has come to a boil.) But salt is always a matter of taste, so play around with the amounts and find what you like best. Anything but iodized. Seriously. It makes your pasta taste metallic. But sea salt, kosher salt, and just about anything else will do the trick. Alright, fine. I get that I should salt my water. I'll do it. Now what should I make?